Dive Journal: After a couple hours on the dive boat in some serious heat, Johnny is really ready to get in the water and dive! We go to a dive site called the “Maze,” which is laid out in a sort of ring of reef patches surrounded by sand. The distance between of the patches is pretty far in some places, and so some extra attention to navigation is going to be needed. Johnny and I are buddying, and so Janel is starting out with the video camera. Janel gets some topside video of us doing the giant stride. The visibility here is the best yet of our Florida diving. Johnny especially likes all the surrounding sand patches. There are plenty of nurse sharks around and some pretty grey angelfish. Janel catches some frames of a medium-sized red grouper, and a cute porcupinefish inside a barrel sponge with some banded butterflyfish. There is also a good sized lobster hiding beneath a ledge, and Janel allows me to do the video honors. As we round the back (northwest) end of the reef ring, Johnny is playing around with the camera (doing his “Star Wars” effects in the sand). From over the sand flats we then see a MONDO turtle emerge and cross directly in front of us. When I see it, I rapidly swim back to John and receive the camera from him to get some video. 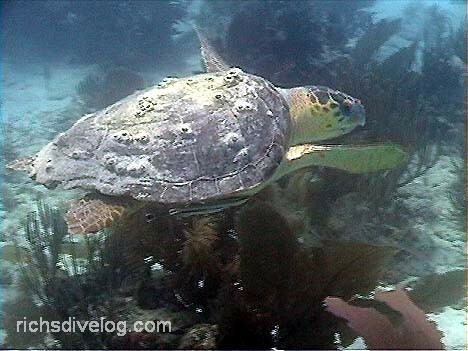 I have never seen such a big turtle, later identified as a loggerhead. The turtle is probably over 4 feet long – big! He gives a great show as he slowly swims in front of us across the reef. Janel and Linda exit the dive after about an hour but John and I are not quite ready to get out of the water. There is a small reef patch we haven’t seen yet and head over there to explore. There is an interesting exchange going there between two graysbys and a goldentail moray eel, and I can’t quite figure out what is going on. Johnny takes some eclectic video of a metal cage, and then of the dive boat.